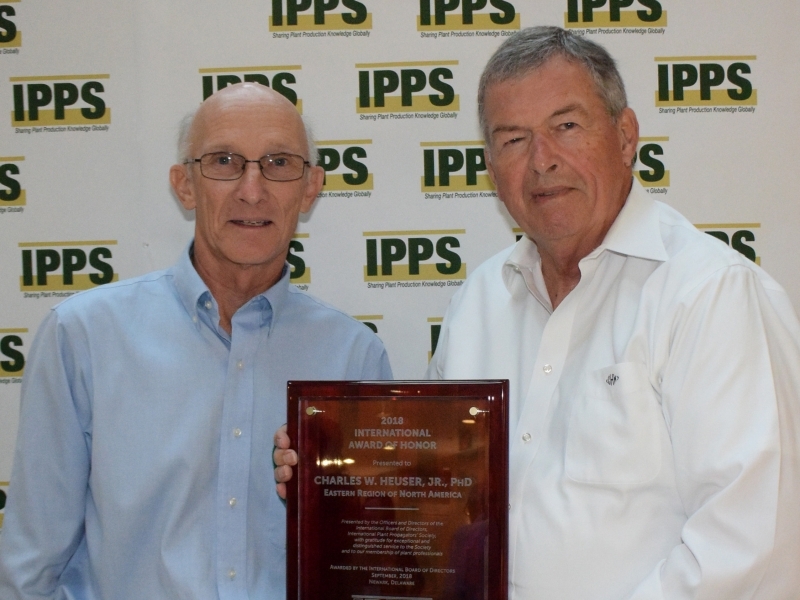 Congratulations to Charles Heuser for his many years of extraordinary service to IPPS at both a regional and international level. In acknowledgement of the remarkable service to IPPS the Eastern Region of North America awarded the 2018 IPPS Award of Honor to Dr. Charles Heuser at the recent annual conference in Newark, Delaware. Charles has been a member of IPPS since 1963 – 55 years. While not quite the longest member attending the Eastern Region meeting, he is certainly one of the more senior members of the region. He holds two degrees from Rutgers University and one from Purdue and was part of the horticulture faculty at Penn State for almost 40 years, was also responsible for coordinating the educational curriculum in that department. He taught classes in woody plant identification and also computer aided design. He was given the status of Professor Emeritus when he retired in 2011. He taught at Longwood Gardens for several years as an adjunct instructor for plant identification classes, with an audience of gardeners, as well as landscapers, many of who didn’t pay attention when they took his classes at Penn State! He was one of the first faculty at Penn State to convert his courses to website access – allowing his courses to be taught remotely at three campuses. Earlier years of research in plant physiology and propagation earned him the nickname of “Mung Bean Charlie” among his colleagues – later he did extensive research in tissue culture propagation and other areas. He was co-author and editor of two publications with the Pennsylvania Nursery Association on nursery production and on environmental resource management and an editorial consultant for a book published in the United Kingdom in 1997 - The Complete Book of Plant Propagation. He has Served as a judge for the awards given by the American Society of Landscape Architects and as a judge for the Gold Medal Plant awards presented by The Pennsylvania Horticultural Society. Has also been Editor for the IPPS Eastern Region for 41 years – having taken the job in 1977. He was elected a Fellow of the Eastern Region in 1994 and received the Eastern Regions highest award the same year – the Award of Merit. Both awards recognized Charles for his contribution to the field of plant production through research and teaching and for his service to IPPS. Charles has been IPPS International Editor since 1992 – 26 years – having started with Volume 41 and will retire at the end of this year. I wonder how many IPPS conference speakers have been harassed by Charles when they didn’t return their manuscripts back to him on time. A stickler for detail, correct grammar and correct plant names, he has helped maintain a very high professional standard for the IPPS Proceedings. For many years the IPPS Proceedings were the Google and Wikipedia of the horticultural industry well before the internet was developed. Married the last 25 years to Patricia Heuser, who served as IPPS International Secretary for a few years. Charles retired from Penn State University a few years ago and now lives in Carlisle, Pennsylvania where he has extensive display gardens and not enough help – so says his main source of labor - his wife! The International Board of Directors of IPPS honors an active member of the Society each year from the Region that hosts the International Tour and International Board of Directors meeting. This gives each region the opportunity to recognize an outstanding member from their own region. The International Tour and board meeting rotate through each region every eight years. The criteria for the Award of Honor is quite simple – The candidate must be an active member for at least ten years and has offered the society and industry outstanding service.